David Despain covers a recent conference on paleo diets. Author Ann Douglas tells her husband how much she weighs (after 26 years of marriage) and the world does not end. 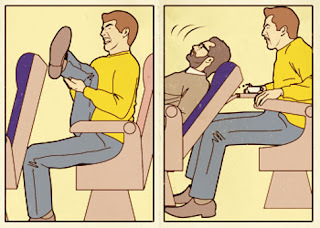 Here's a piece I loved from Slate on reclining airplane seats and how people who use them might be evil and so too might be whoever invented them. A bonus piece this week too as an update to a post I wrote on Wednesday. Alberta Health Services denies backgrounder on vegan diets that didn't provide any advice on how to obtain certain nutrients other than eat animals was meant to diss vegan diets.